Planning a big outdoor, family picnic with lots of Maine lobster? Make outdoor preparation easy and fast with a portable, propane lobster cooker. Working just like a gas grill, the big lobster pot sits outside on a portable burner with stand. The cooker keeps the heat, water and mess outside and away from the kitchen. And most important,it keeps the lobster close to the picnic tables and guests. A portable cooker easily allows the chef to deftly pop the lobsters in an out and keep them coming for all the hungry guests. Ranging in size from 30 to 50 gallons, the bigger pots can cook up to ten or more medium sized Maine lobsters at a time. There are many brands to choose from, but the quality lobster-pot set ups come with a stand, propane burner, aluminum pot with ridges and an internal steamer basket. This gives the cook the option of steaming the lobsters or boiling them. The internal basket is a must if you want to prepare hefty amounts of steamer clams, mussels, crabs or crawfish. The cook can also use the basket to make a clambake by adding, lobster, shellfish, potatoes, onions, corn and more. Set the unit up away from foot traffic to avoid accidents but close to a water source so you can easily add water as needed. 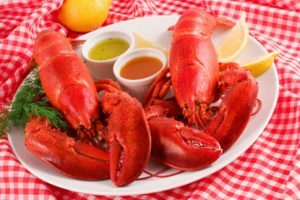 Make sure to buy fresh Maine lobster and keep them cool right up until you are ready to cook them. A cooler holding just the lobster with plenty of frozen gel packs and wet newspaper is the best solution. Do not use ice or put them in fresh water. The lobsters will perish immediately in fresh water. Fill the pot about 2/3 of the way and add two tablespoons of sea salt per gallon. 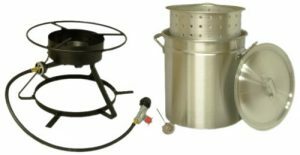 Lobster pot with steamer basket and portable gas burner makes outdoor cooking easy. Set the burner to high and bring the water to a roiling boil. Place the live lobster head first into the pot one at a time. You may leave the bands on the claws. Leave enough room in the pot so you can stir the lobsters from top to bottom so they cook evenly. After the lobster are in the pot, allow the water to return to a roiling boil, cover the pot and start timing. A 1-½ pound lobster will be done in 14 minutes. Do not overcook. When done the lobster will be bright red and will usually float to the top of the pot. 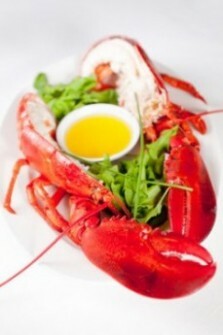 To steam the lobster instead of boiling, add enough water to cover the bottom of the basket. Add salt. Bring water to a boil, add the lobster headfirst and cover. Stir the lobster a couple of times so they cook evenly. A 1-½ pound lobster will steam in 14 minutes. As the lobster are cooked and removed you can add more to the pot to make it easy to keep them coming. Add water as needed. Allow the lobsters to drain a minute before serving. A word of caution, these portable units are built to hold the weight of all that hot water and the lobsters. Don’t go off and try to put a lobster pot on one of those small portable propane burners or stoves you might use to make an omelette on. The water weight alone will crush it.